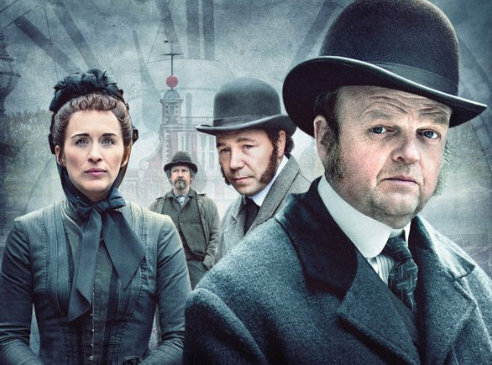 BBC One has released a new trailer for Tony Marchant’s (The Mark Of Cain) adaptation of the classic Joseph Conrad thriller, The Secret Agent. The three-part drama stars Toby Jones, Vicky McClure, Stephen Graham and Iain Hart, in a story about Verloc (Jones), whose seedy Soho shop hides his role as an agent of the Russian Embassy, spying on a group of London anarchists. Furious that Britain tolerates violent extremists, the Russians want Verloc to provoke a bomb outrage that will trigger a government crackdown. Caught between the Russians and the British police, Verloc drags his unsuspecting family into a tragic terror plot. McClure plays his previously loyal wife, Winnie, with Graham starring as Verloc’s adversary, Chief Inspector Heat. Hart plays the dangerously unpredictable Professor. Produced by World Productions, The Secret Agent begins on BBC One on Sunday, 17th July at 9pm.